When visiting the mineral springs and the many attractions in and around the township of Hepburn Springs, you’ll love being in walking distance of everything you need. The quality and selection of Hepburn Springs restaurants will impress those seeking high quality dining and great wine. For such a small town there is plenty of choice. We visited The Argus restaurant on a cool spring evening. This first class dining destination in Hepburn Springs has beautifully cooked food, interesting ingredients and great service. The Argus is located in Pepper Mineral Springs Resort on Main Road and is one of the best Hepburn Springs restaurants to choose if you’re wanting something special. It has received some great reviews, achieved a chefs hat rating in the Good Food Guide in 2015 and was featured in Gourmet Traveller’s Top 100 Australian restaurants, 2015. Our attention was caught by the building’s facade and entrance, a great example of elegant deco architecture. We half expected a voluminous 1930s saloon to pull up with Lauren Bacall or Humphrey Bogart. Visitors enter through an enclosed, glassed verandah into a grand reception. A classic bar with deep leather lounges is on the left. To the right is the Argus Dining Room. We were welcomed by friendly, professional staff, who directed us to our table. Low lighting, high glass partitioning between tables, and a warm fire distributing its orange glow, created a feeling of intimacy. As we expected for a Sunday night, it was not overly busy. But there were enough people dining to create a warm atmosphere and keep the staff busy. Although the interior takes its design cues from the 1930s – sleek modernism, timbers and dark leather – the feeling is still very contemporary. Colours are muted – a perfect backdrop to the oversized and dramatic series of photographs on the walls. The photos depict various rural scenes and have been treated with varying exposures for effect. They are dramatic and beautiful. Our expectations were not disappointed when it came to the food. The menu is described as modern Australian cuisine and confidently uses some surprising ingredients with great success. Many of the ingredients come from the kitchen garden onsite, and beef and lamb is sourced from the owner’s nearby property, Vale Farm. Mains include John Dory with white gazpacho, leek, black garlic and preserved cumquat, or local lamb, jerusalem artichoke, celeriac and goats milk yoghurt. Sides included salt-baked Mount Prospect potato with fermented chili and togarashi (these were absolutely mouth watering) and organic butternut pumpkin and hazelnut dressing. Although the serving sizes were modest, we were more than satisfied with a main and dessert. The combination of flavours and ingredients are expertly achieved and presented beautifully. The result is dining slowed down to appreciate each mouthful. For dessert we were treated to 72% chocolate and organic chai, wattle seed, garden mint and honey, and late harvest pineapple, mascarpone, salted pretzel, ginger and turmeric ice cream. Who knew that turmeric ice-cream could be so unbelievably good. It was! I’m committed to trying something like this at home. With considerable public acclaim, the Argus Dining Room is surely one of the best Hepburn Springs restaurants. 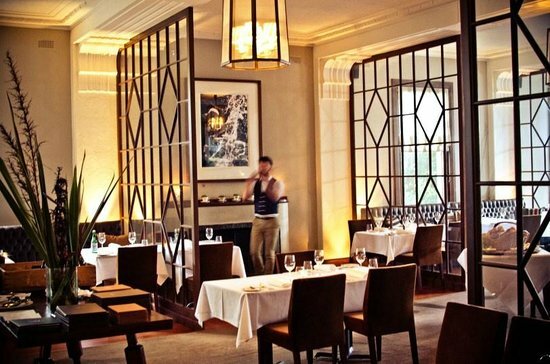 For a romantic weekend away, The Argus is perfect for dinner. In warm weather it is a short walk from the centre of Hepburn Springs and an easy stroll from many Hepburn Springs accommodation locations. While we visited in cooler weather, we imagined summer dining outside on the terrace or in the enclosed verandah was worth a return visit. For those coming to Hepburn Springs for dining at The Argus, there is plenty of luxury accommodation in Hepburn Springs. Hepburn Spa Pavilions is a three minute walk from the Argus Dining Room. 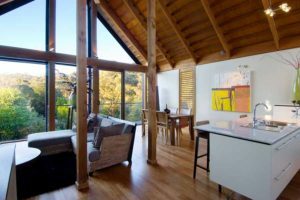 Each two storey villa has two bedrooms with luxury linen and stunning hydro spa, overlooking tall gums and Mineral Springs Reserve. Kookaburra Ridge, a short three minute drive, provides family accommodation on a rustic two acre Italian garden.